Ang Gomburza ay isang daglat - o pinagsama-samang piniling mga bahagi ng pangalan - para sa tatlong martir na paring Pilipinong sina Mariano Gomez, Jose Apolonio Burgos, at Jacinto Zamora na binitay sa pamamgitan ng garote noong Pebrero 17, 1872 ng mga Kastila sa mga paratang ng pagpapatalsik ng pamahalaan na nagdulot ng pag-aalsa sa Cavite noong 1872. Nag-iwan ang kanilang pagkabitay ng mapait na damdamin sa maraming mga Pilipino, lalo na kay Jose Rizal, ang pambansang bayani ng Pilipinas. Inihandog ni Rizal ang kaniyang nobelang El Filibusterismo para magsilbing alaala sa tatlong paring ito. 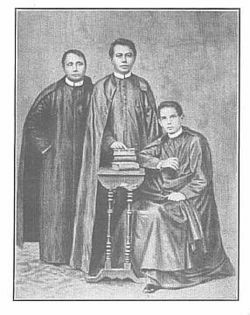 Gomburza is an acronym for Fathers Mariano Gomez, Jose Apolonio Burgos, and Jacinto Zamora, three Filipino priests who were executed on February 17, 1873 by Spanish colonial authorities on trumped-up charges of subversion arising from the 1872 Cavite mutiny. Their unjust execution enraged and left a profound and bitter effect on many Filipinos, especially Jose Rizal, the national hero, who, himself, was to suffer martyrdom. The uprising by workers in the Cavite Naval Yard was apparently just the pretext needed by the authorities to redress a perceived humiliation from the principal objective, Father Jose Burgos, a rising star who, by dint of intellectual gifts and scholastic achievement, threatened the established order. During the Spanish colonial period, rigid class dinstinctions were effectively observed between Peninsular Spaniards, those born in Spain or 'Peninsulares,' those born in the colony of Peninsular parents, or 'Insulares,' those born in the Philippines of mixed Spanish blood or Spanish Mestizos, Chinese and Chinese Mestizos, and, finally, Indios (Natives). Father Burgos was Spanish Mestizo, a Doctor of Philosophy whose prominence extended even in Spain, such that when the new Governor and Captain-General Carlos Maria de la Torre arrived from Spain to assume his duties, he invited Father Burgos to sit beside him in his carriage during the inaugural procession, a place traditionally reserved for the Archbishop and who, as expected, was a Peninsular Spaniard. The arrival of the liberal governor de la Torre was not welcomed by the ruling minority of friars, regular priests who belonged to an order (Dominicans, Augustinians, Recollects, Franciscans) and their minions in civil government, but mistakenly embraced by the secular priests, majority of these Mestizos and natives or Indios assigned to parishes and far-flung communities, who believed the reforms and the equality they sought with Peninsular Spaniards were at hand. In less than two years de la Torre was replaced by Izquierdo who turned out to be a pliant tool of the friars. The so-called Cavite Mutiny of workers in the arsenal in the naval shipyard produced a willing witness to implicate the three priests, who were summarily tried and sentenced to death by 'garrote.' Father Gomez, the oldest, went to his death heroically. Father Zamora, the youngest, guileless and totally befuddled, died with a whimper. Father Burgos, hoping for a reprieve which never came and scanning the distance till the very last moment, met his death soaked in his own tears. Significantly, in the archives of Spain, there is no record of how Izquierdo, himself a liberal, could have been influenced to authorize these executions. The aftermath of the witchhunt produced scores of suspects most of whom were exiled to Guam in the Marianas, who, except a few who managed to escape to other ports like Hongkong, died there in penury. It was a period when a pall of hopelessness enveloped the country, steeling the resolve and patriotism of a sentient minority, giving rise to a new generation of heroes of whom the Rizal family was to become the standard bearer.